I've been asked pretty regularly what books and catechesis tools we have used with Sadie over the past year or two and last night, when the babies were all finally in bed, I got to work compiling a list, which slowly developed into this post. At five she is still quite little, but these are the books over the years that she's loved and that have as a result been read over and over again. From the time when we found out we were expecting Sadie I was pretty much gearing up to teach her about our faith. After all, what could be more important? I'd wince when I'd read blog posts that began with a lecture (or at least that's how it would feel to me since the possible reality of a child falling away from the faith has been very much in thoughts since having children) about how there's no guarantee you'll raise a child who'll continue to love and believe in God. I'd find myself wondering if there are really people who believe that there's some sort of guaranteed formula. Because while I've spent a considerable amount of time thinking about this subject (and praying about it) it has always seemed abundantly clear that free will is there, as it ever is, offering a choice to believe or turn away. My job, as I see it, is to give my children the best possible tools to make that choice and to be able to defend their faith against a world that sometimes seems incapable of understanding it. 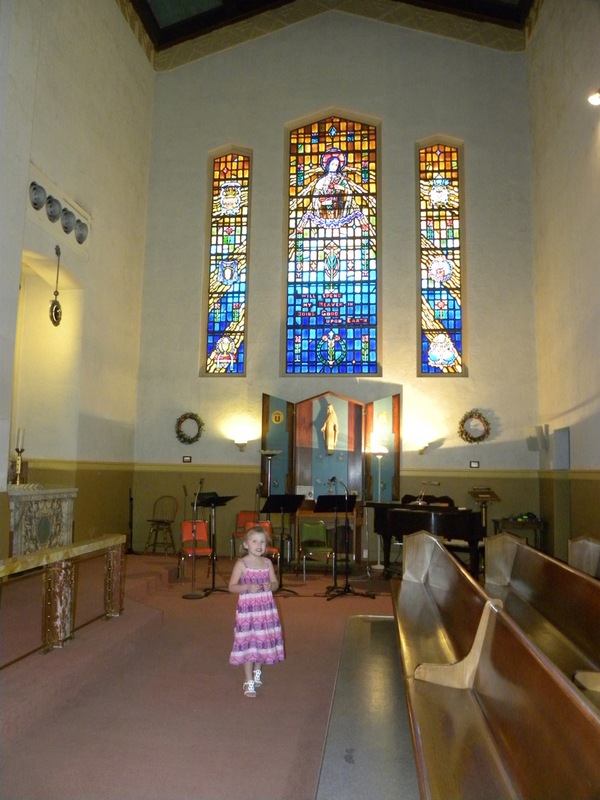 I was always on the look out for books and activities that might help our little ones grow in faith and love of God and over time our collection grew. As we've gone along, certain books have definitely stood out. They are the books that are so well loved that I'll purchase a second copy when the first one falls completely apart. And so, in this post which I've written several times in my head, and which you can definitely add to in the comment section, I'll share what has worked for us so far. I've decided to break it up by age and share what's worked tried and which books have become family favorites. spending a morning on the couch. When I thought of writing this post there was really only one place to begin... and it wasn't with a book. If you've been around here long enough you probably remember Holy Baby. 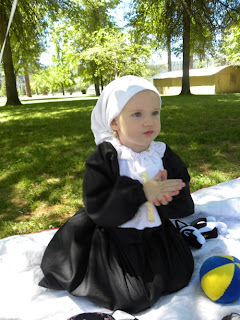 She's the little nun doll that first began Sadie's nun obsession, when she was two years old. She's the doll that Sadie held up to me when she was still two and announced "Want Ho Bay dress" (I can't remember how she said dress or if she just pointed) but I do remember that she couldn't yet say "Holy Baby." 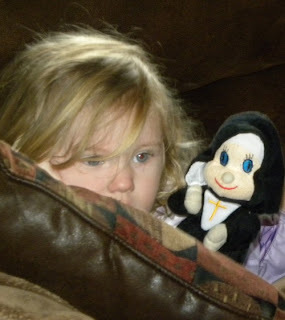 We purchased the doll after Sadie fell in love with the Holy Baby DVD. As an adult you may not be all that impressed when you first turn on the DVD. It's the prayers of the rosary in seven different languages. While the prayers is said, various images of little kids and religious items (and toys) flash across the screen. And our children have unanimously loved it. Silence falls when the Holy Baby DVD goes on (that alone is probably a pretty serious recommendation for most parents with little kids, right?). The Holy Baby DVD (and her little doll) began Sadie's fascination with nuns. Our go to baby Bible isn't specifically Catholic. It's one that we first saw at the Catholic book store we used to frequent back in California and I've now read it cover to cover many times. We have two copies that are falling apart and one new copy that Nani gave Patrick for his baptism. I've glued the cover back on Sadie's copy at least once and she will still sit on the couch and read it's memorized pages aloud. My all time favorite little kid book is We Go To Mass. It's accompanied us to many a mass over the years. Our first copy has been loved to pieces (not an easy task since both of our copies were the board book version) and the other is well on its way to needing to be replaced. I recently got a copy of a new book that looked like it would be similar (the fact that I've liked everything else by the publisher sold me on it), but after reading Celebrating Mass I recommend skipping the newer version altogether and sticking with We Go to Mass (the picture on the cover should have warned me off... if you like your churches without a tabernacle in sight this might be a book you'll like... If you don't steer clear.). Along with We Go To Mass we used Our Blessed Mother, Our Guardian Angels, Gifts of God and Our Friends the Saints. Since Patrick and Mae have come along we've added a few favorites from the Magnificat website like My First Catechism, My First Pictures of Christmas, and My First Pictures of Mary. While I was waiting for my babies to be big enough to really start asking questions and learning about our faith in a more in depth manner, I also did quite a bit of reading on my own. As a convert I wanted to learn more about traditions and celebrations that we could incorporate into our lives and the two books that I have poured over have been The Big Book of Catholic Customs and Traditions and the Catholic Home: Celebrating the Traditions of Holidays, Feasts and Everyday by Meredith Gould. They are my go to books and I've read the same words over and over again. I would strongly recommend them if your looking for a book that will give you ideas for celebrating our faith with little ones! Beside reading and little family feast day celebrations, attending Mass together and saying a family rosary each night are important parts of the rhythm of our days and weeks. In my experience days and weeks that involve regular family prayer time just go more smoothly. Paul and I began praying the rosary together before Sadie was born. When she came along we kept on praying it together. There were many nights when she was rocked to sleep nursing as we prayed. Now Patrick crawls over and plays next to Paul while we pray and Sadie sits next to me holding her rosary and saying the words along with me. While some nights can be wild (anything can happen when you have a ninja climber like Mae) there's never been an argument about whether or not we're going to be praying. The kids know that it's something that we do, no questions asked... and on nights when we miss praying together at least one of the kids is going to be upset about it. 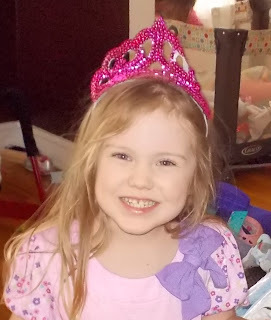 To read about what worked for our 3-5 year old click here for part 2! It's especially geared toward parents raising kids 3 and under in the Catholic faith!